The Wiscasset, Waterville, & Farmington Railway Museum (WW&F) is hosting their annual Easter Eggspress on April 20, 2019, at WW&F Museum located at 97 Cross Road, Alna, Maine. 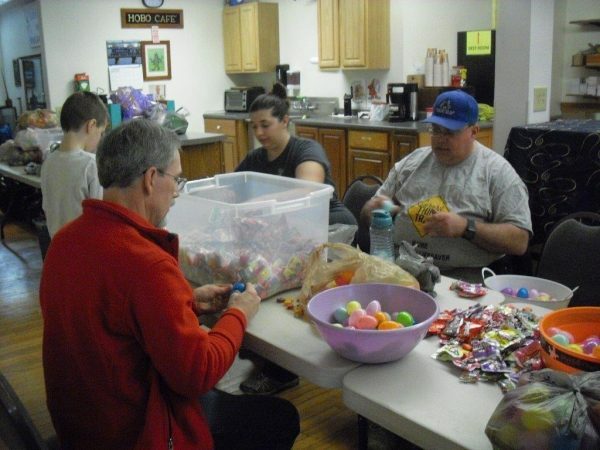 With the help of members of the Great Falls Model Railroad Club, there are 10,000 eggs filled with candy for children ages 4 and up and with non-candy items for the 3 and under group. This is the second year that the Great Falls Model Railroad club has helped fill the eggs. The volunteers at the WW&F are extremely grateful for the help GFMRRC members have provided over the last few years with stuffing eggs and working on a real railroad. The first WW&F train on April 20 departs at 10:50 a.m. and the last train departs at 3:30 p.m. Tickets are available for purchase now online at WW&F Easter Eggspress or visit online at www.wwfry.org and click on events. Advanced tickets are $10 for adults, and $5 for children four and up. Children three and under ride free. Tickets purchased the day of the event are $15 for adults and $10 for children ages four and up. Children ages three and under will still ride free. Hop on board for a short train ride into yesteryear as the train chugs its way through the Maine woods. When the train arrives at the next station on the line, visitors can hardly contain their excitement as they look out the windows and see the fields of Easter eggs. As soon as everyone is off the train and in their respective lines for their children’s age group, a short announcement is made and kids are at the ready to begin their hunt for Easter eggs. Once all the eggs are collected, visitors get back on the train and return to the main part of the museum. Visitors are welcome to look around the shop and buildings during their visit and questions are always welcome. Hope to see some of you during the Easter Eggspress!